Video for the seminar in Montreal, Canada. Care of Jean Frenette Sensei of International Karate-Do Seminars. 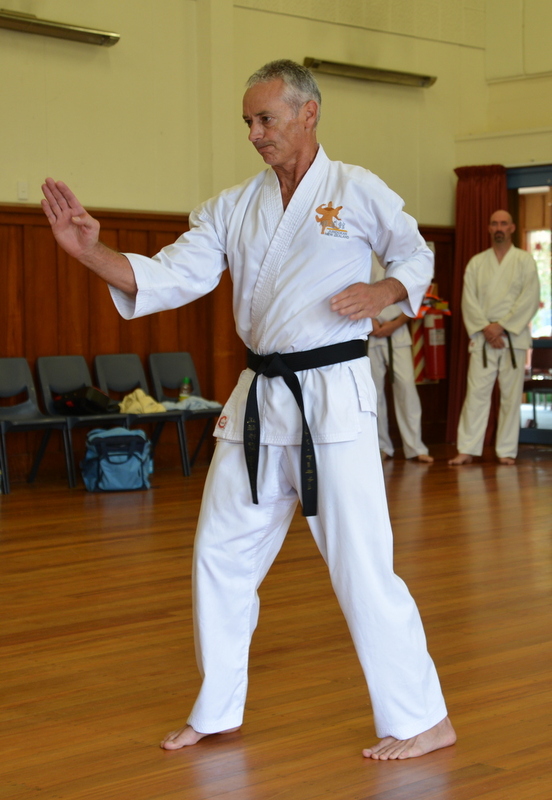 Kinjo Sensei and Gima Sensei 9th dan Jundokan Okinawa senior instructors have confirmed that they will travel to Nelson, New Zealand in November for a 3 day seminar. Seminar fees are expected to be approximately NZD $250.00 for the 3 days. 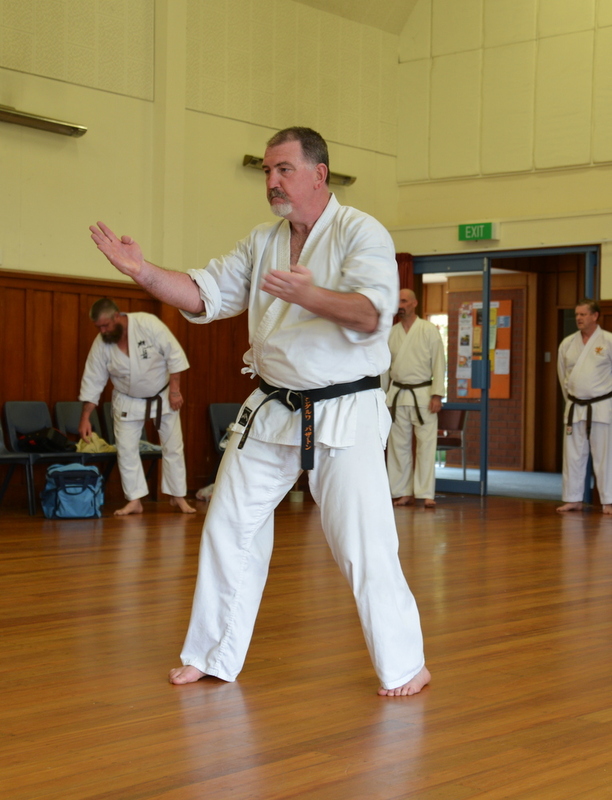 Senior Jundokan New Zealand instructors are already starting to plan for this exciting event. Jundokan Shibucho members training in Okinawa recently. Bryan Williams representing Jundokan New Zealand attending the 60th founding anniversary of Miyagi Chojun Sensei in Okinawa recently. In my last writings I touched on Bunkai, and how as our Knowledge and understanding of our Karate changes and grows, so does the application of what we study. I am continually intrigued reading articles all over the globe telling me to “Own my own Karate”. Hell, I thought I did. Does that mean we have to all see things the same way? Or just to do things our own way? Neither of these are the case of course, and Im sure that what these ownership statements are getting at is that as Karateka, we should be responsible for our own training and growth in our chosen art. Many people are happy following their teacher, and learning what they can from him or her. Does that mean that they are not owning their own Karate? Of course it doesn’t, it just means that they have found where they want to be in their art, and are happy there. Now that’s ownership! Sensei John Jarvis said to me some time ago at a difficult time in my career of Goju. "Find a teacher you can trust, and stick with him” ... wise words indeed, and yes, I did. As we grow in our art we are encouraged to look deep into our Kata and come to understand and practice the Bunkai within. Now that's where the problem starts, and where egos can get in the way. We must practice of course, however, as Im sure you all know, if we practice bad techniques, well, we will get very good at them and that’s not what we want at all is it? Practice your Kihon and grow from there, and you will be surprised where it leads you. The fact is it has to work. What would be the point of it if it didn’t? Find a partner to work with and make sure what you are doing is effective. If you are finding that it isn’t then you may have to adjust it to suit your size or stature. Ask if you're not sure. Im sure you are surrounded by a Dojo full of people who can help you. The fact that they have decided to turn up in the first place tells me that they have made the choice to “Own their Karate”. It's that simple really. Do not ever think that you have Bunkai that is “yours”. To do so would be arrogant. So who’s is it I hear you ask ? If I “own my own Karate” then mustn’t my Bunkai be my own? No it mustn’t. No matter what we do or how we apply our Kata, are we really that arrogant to believe that someone else before us has not done the same? It is merely the Bunkai that you prefer to use, that’s all. And you prefer to use it because it works right? I had a wonderful chat with a good friend today who runs his own Ju-Jitsu club here in Dunedin, and we ended up laughing at each others techniques. Why? Because they were similar, not the opposite as you may think. 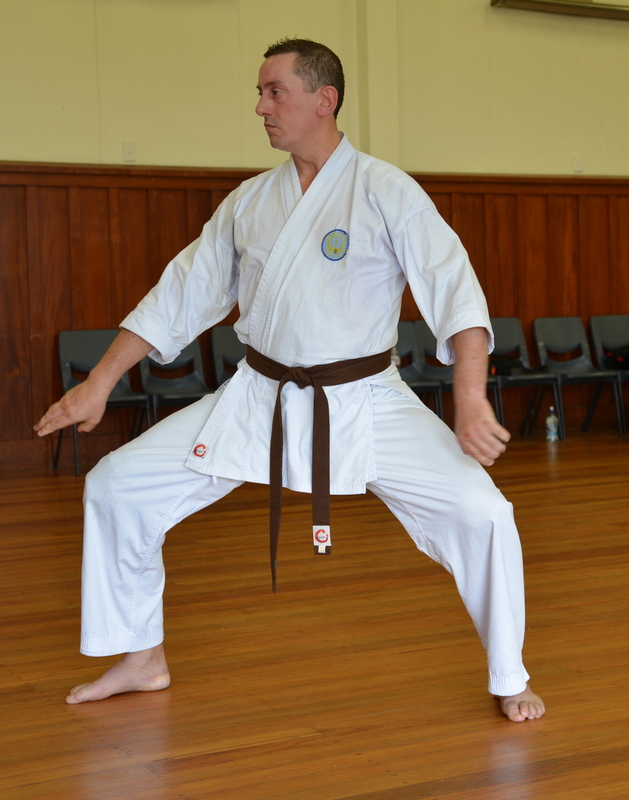 Merriman Sensei's insight into the deeper meanings of the terms that we frequently use in the dojo, and why it's important to fully understand their individual nuances. Right to left: Mancuso Sensei, Gima Sensei, Kinjo Sensei and Nakada Sensei. Did you know that karate, arguably the most well known martial art in the world, originated in Okinawa? Me neither. But it turns out the small archipelago beneath mainland Japan is where it all began. It wasn't until the early 20th century that Karate made it to the Japanese mainland. On a recent visit to Okinawa, I had the chance to meet with a local instructor and do a refresher of my rusty karate skills. Kevin Chaplin, a Brit now based in Okinawa, was my mentor for a session at Murasaki Mura theme park. "True karate has been diluted, changed and adapted. The modern approach is to make money, but you have to balance the money with correct teaching. Karate is an education, not just a combat sport." Though I learned karate as a teenager, we never once delved into the philosophy behind it. But my story is a common one, according to Kevin, as many karate schools are more concerned with membership and increased revenues than teaching the true meaning behind the martial art. "Traditional training is hard, so many schools just hand out belts to keep people coming back. That’s why sports karate became so popular, there’s money involved. If your students are successful in a competition, you get more students, more money, more recognition… but you sacrifice the true meaning of karate along the way." "The Okinawan spirit is to 'just get on with it'. That's what's different from some of the other Japanese martial arts, and some of the teachings coming from China. There’s a little more spirituality involved, but the Okinawans are more pragmatic towards it. There’s no shortcut to doing a perfect punch. Just get on with it. If you have to practice 1000 times a day, just do it, whatever it takes, and you'll learn." Educating tourists on the origins of karate at the Murasaki Mura theme park, as well continually improving his own skills with a local sensei, Kevin views karate as character building. "As a karate practitioner you always talk about your mind, your body and your spirit - the three together. Karate has that built in, you go in there with the mindset to do it and improve." "When I teach the kids, I just try and keep that in mind. Teaching them to clean the dojo, show respect to each other. We always talk about who is that best, but you’re always teaching everyone to improve." "If one kids really sharp, really fast, a great fighter… but the kid who was really nervous and crying the first day, three months later he’s facing up to the strong kid. That’s the biggest success. The kid who’s always winning, that’s fine, but the biggest success is the kid that grew in some way." After having only a brief training session with Kevin, my karate skills are still as rusty as ever. I’m not about to go back to training, but I have developed more of an appreciation and understanding of the history behind the martial art. If you seek the true meaning of karate, Okinawa is the place to find it. Recently the JNZ Dojo heads met in Auckland to have our AGM and of course to train and pick Sensei Paul’s brains as much as possible before heading to their respective homes. The general consensus was that since our trip to Tasmania, we are most definitely heading in the right direction training wise. The focus is fitness, Kata, and of course Bunkai. Bunkai is no new thing, its just that as our journey in Karate moves forward, so does our understanding of our applications, as well as our ability to preform them in a way that works (obviously). So exploring new Bunkai may not actually be the study of “fancy new moves” but the revisiting of Kihon, because as you all know without the foundation of Kihon, you have no Karate at all. So, can we look at our Kihon in a different way ? Of course we can. For example I am six feet five, you may have noticed that Blake is not, so essentially, what works for me may not work for him, or indeed may have to be adjusted to fit his body size. Therefore, the Kihon is the same, the way it is preformed is not (I’m sure you all know what I Mean). From our Kihon Bunkai we move forward and introduce Renzoku Bunkai. This again will Vary from student to student as long as the fundamental Kihon remains the same. Easy isn’t it? So where to from here.....yes you guessed it , More of the same in the weeks to come. 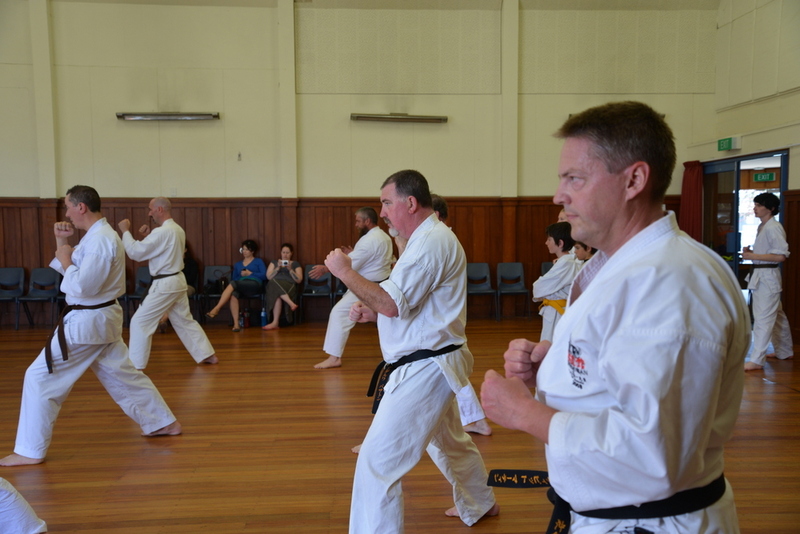 Dunedin dojo is following on with what was learnt in Auckland, and continuing to further develop our own own bunkai suited to our individual karateka. Those looking to grade in November are progressing well, and although Darryl is spending most of his time training with Steve Archer in Arrowtown, he is checking in regularly and his Dojo is slowly gaining momentum with help from Steve Dudder’s regular visits and even a special visit from our Auckland young gun, Sensei Bryan Williams (SBW)....things can only be looking good. As for me, well its been three weeks out of the Dojo with torn back steaks, and yes I am guilty of walking like a very old man, however I hope to be back training (slowly) soon. Thanks Blake for leading the troops in my absence you and the yudansha have been invaluable ( as always) to our Dojo. 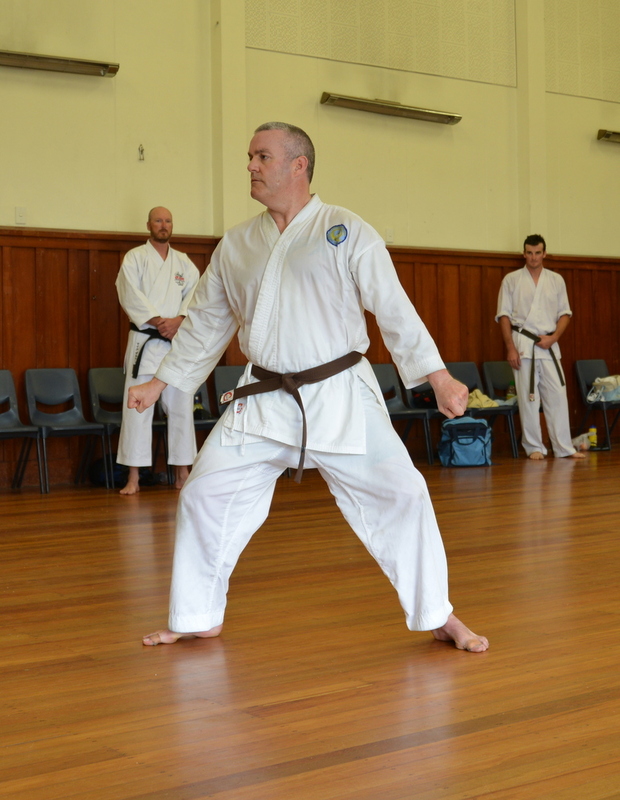 Richmond dojo is slowly building up members with those karateka interested in Okinawa Goju Ryu. We now have 12 regular members training, including 2 sho-dans that have previously trained in Shotokan and are working hard at changing their technique. Winter is testing the commitment of all and turning up for training on a cold Saturday morning certainly is refreshing and requires 魂 (tamashi). 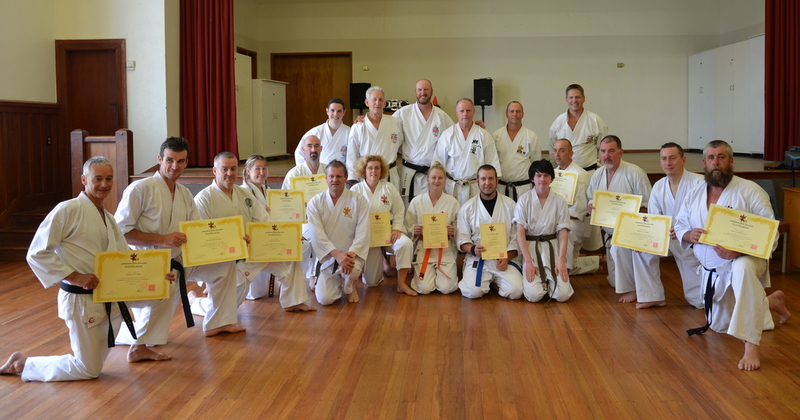 Richmond dojo will play host to the annual JNZ dan grading on 16/17th November. This year, emphasis will be on fitness, kata and bunkai and those testing should work hard on these areas. The Westport dojo has been continuing as always with a concentration on kata and application training as we look towards potential gradings at the end of the year, and training in Nelson in November. 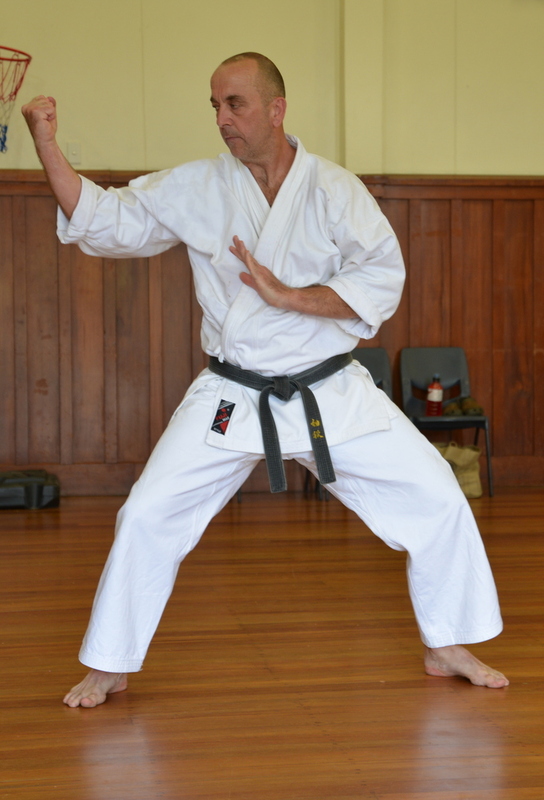 With all kinds of commitments etc, Auckland’s Taupaki dojo will be holding our kyu grading at end of November, and training towards that has commenced. 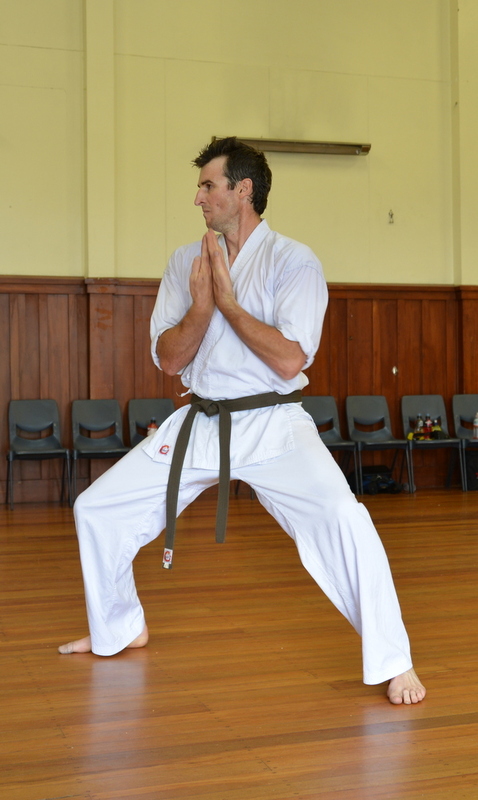 Taupaki Dojo’s main focus recently has been on fitness for all members. The junior group’s focus is on fitness and Kata as grading approaches. Likewise, the intermediate class has been focused strongly also on fitness and kata but with more time spent on bunkai. And of course those that still remain in the senior level – it’s all go. With Sensei Bryan taking a small back seat until he is fully recovered. Sensei Brian is also looking to attend the Jundokan’s seminar commemorating the 60th anniversary of Miyagi Chojun Sensei and the 15th anniversary of Miyazato Eiichi Sensei’ in Okinawa in November. No doubt the information he learns whilst over there will be a valuable asset to our organisation, and we look forward to hearing all about it upon his return. If you happen to meet him at the corner of a street, Mr. Yasuda Tetsunosuke will remind you of a gentleman of old time Okinawa. In the post war Okinawa, he worked on US military facilities before opening his own real estate company named Yasuda Jutaku Co., Ltd that he still runs today. While at a first sight you might not notice it, the life of CEO Yasuda was supported by karate and yoga. Born in 1926, Yasuda sensei became a student of Miyazato Eichi sensei, a direct student of the founder of Goju-ryu, Miyagi Chojun sensei. As he explains, "The reason why I chose Goju-ryu is because this school had the breathing kata Sanchin and Tensho. This is because I studied the way of breathing through Yoga." Having encountered psychology at university, Yasuda sensei has always lived a life where severe karate training and Bushido way of thinking are like the two wheels of a bicycle. Yasuda sensei truly believes that "It is important to face oneself in an honest way. Unfortunately, in the case of many karate people, they are focusing on the outside aspects of karate. That is why when I look at martial arts today, I can not stop thinking that it has gotten out the way of Budo. Ideally, if one practices karate thinking of it as a way to build himself, he will find his Ikigai, his purpose in life". He goes on saying that "Human beings should follow the principles of the Kamikaze units, living as if today was the last day of their life. This concept should prevail for life but also in karate and never be forgotten."